Here's another John Updike limited edition from the Lord John Press. Originally published in the New Yorker in 1976, this 1978 bound edition of "From the Journal of a Leper" is limited to 300 numbered copies and 26 lettered copies (that I believe were bound in some amount of leather). "From the Journal of a Leper" is a strange little story about a man afflicted with "spots, plaques, and avalanches of excess skin, manufactured by the dermis through some trifling but persistent error in its metabolic instructions, expand and slowly migrate across the body like lichen on a tombstone." Not technically leprosy in the traditional sense, but a troubling bodily condition that Updike can use in all its metaphorical capacity. The narrator is a ceramicist, whose smooth, perfect vases provide the story with a well-toned balance to its otherwise epidermal focus. The book is beautifully printed in red and black, with a delicate, ornate insignia on the title, limitation, and final page. This is the second book I've featured from the Lord John Press, and it will certainly not be the last. Lord John Press has produced limited editions like this from Ray Bradbury, Norman Mailer, and many other high-profile, collectible authors. I'm shocked that these are still floating around the used market--while they're not primary publications by these writers, many are deceased and the fact that you can still get these books for under $100 is pretty remarkable. I found From the Journal of a Leper on eBay a few weeks ago for about $40. Check them out! 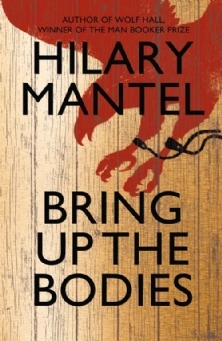 Hilary Mantel just won the 2012 Man Booker Prize with her outstanding Bring Up The Bodies. I'm so glad I didn't skip this one. I was originally inclined to pass on it due to my low enthusiasm for Wolf Hall, but Bring Up The Bodies is an entirely different novel. Taut, exciting, and relatively independent of its predecessor, I wholly recommend this and think it's a great pick for this year's prize. Mantel is also the third novelist (and the first woman!) to have won the Booker Prize twice (Peter Carey and J.M. Coetzee are the only others, I believe). She deserves all the praise she's bound to get with this win. Congratulations! This is a limited edition of Jules Verne's wonderful adventure novel Around the World in Eighty Days, designed by British architect David Adjaye for Penguin's "Puffin Designer Classics" series of novels for younger readers. I previously feature Lauren Child's outstanding edition of The Secret Garden, which can be seen here. Limited to 1,000 numbered and slipcased copies, Penguin/Puffin's Around the World in Eighty Days is a finely designed and commendably modest rendition of the classic. Adjaye chose a matte gold color for the book's boards and shiny gilt edges for the exposed pages. Even the ink inside is a golden hue! His cover design is not simply for the front of the book but is fully rotational, and is actually carried around the entire book in a subtle and very clever manner. Phileas Fogg's route around the world is very delicately drawn across the map on the front of the book and is carried across the book's spine. The book's title and Verne's name do not appear on the spine; simply the traveler's path through Europe is featured in the center. What's exciting is that the route continues along the other side of the book and cuts through the edges of the boards and down through the pages. And it's really only noticable when you fan the pages open (or look from the perspective of someone actually reading the book). Love the blue ribbon, as well..! When the book is closed, it's hardly noticeable underneath the gilt edges. Naysayers might just consider this a cool gimmick, but I think Adjaye's overall book design masterfully balances the excitement of the rotational motif. A really nice piece! Below is a shot of the limitation page: this is copy 457 of 1000.